Awareness is a key part of defeating DRM. Whether protesting outside Apple Stores in Hazmat suits as we have done in years past, handing out leaflets in front of public libraries, or sending direct complaints to senior executives at Sony, action gets attention, and creates space for change. Please set some time aside in your day on Wednesday to join us for this once-a-year opportunity! We hope you'll work with us against DRM year-round, but coordinating online and physical events on one day amplifies all of our voices. We've made seven banners for you to choose from, but there are so many talented and creative people involved in the fight against DRM that we ask anyone who wants to make a banner to do so. Add your banners directly to the wiki and show the world! An easy way to run a local event is to draft a letter or a flier, get a few people together, and head on down to your local library, Apple Store, Best Buy, or any other local DRM-provider and hand them out. If you do write a letter or flier, please add it to wiki! Let others know why you oppose DRM, and highlight some examples. Last year we had a lot of great blog posts! It would be great to see the same this year. 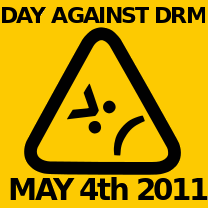 Spread the news about the Day Against DRM on identi.ca by using the hashtag #NODRM. 2) Email us by Friday at info@defectivebydesign.org letting us know what you did!